If you try shooting a basket or throwing a ball at a target, you'll probably come pretty close, even on your first try. But when you put on this special set of goggles and try to make the same shots, things get very interesting. Look at the edge of each fresnel prism and note which direction the ridges point. For the next step, you will need to orient both prisms so that the ridges point in the same direction. Lay each prism over one lens of the goggles. Use scissors or a craft knife to cut away any excess so the prism fits precisely over the lens. Make sure the lenses of the goggles are clean and dry. Peel away the adhesive backing from one prism and press it to one of the lenses, making sure there are no bubbles of air between the prism and the lens. Do the same with the second prism and lens. No tape or glue is necessary; the prisms should self-adhere. Using masking tape, mark a squarish target on a floor or wall, 12–16 inches (30-40 centimeters) on each side. Stand about 9 or 10 feet (3 m) from the target. (The farther you are from the target, the more obvious the effect will be.) Throw the beanbag or ball at the target, underhand. Notice how close you get. Repeat your throw a few times. Put the goggles on, and make sure that you can see the hoop or target through the goggles. Make sure that your throwing hand is positioned so that you cannot see it or the ball through the goggles. Try to hit the target with the ball, again throwing underhand. Notice how close you get. What do you notice about the accuracy of your throw? 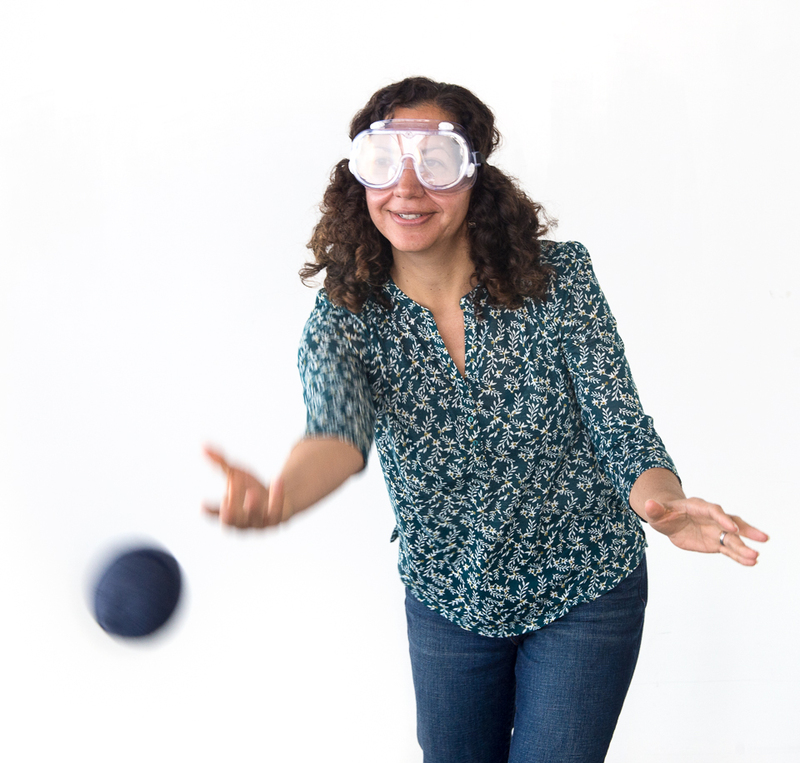 Have your partner retrieve the ball for you if possible—it’s hard to do with the goggles on. Keep trying until you hit the target three times in a row. How many tries does it take you? Take the goggles off and try again. Notice how close you get to the target. Keep trying until you score three times in a row. How many tries does it take you? What do you notice about the accuracy of your throws? When you throw a ball at a target, many different parts of your brain are working together. Your eyes and visual systems give your brain information about where things are, while your proprioceptive systems give your brain information about where your body is in space. Your motor systems use all this information to produce movement, so you can throw the ball in the right direction. When you first put on the goggles, the ball doesn’t go where your eye says it should. Because of the way it refracts, or bends, light, the prism makes objects in front of you appear to be to one side. Light travels from the target to your eye along the path shown by the arrows in the diagram below (click to enlarge). As light passes through the prism, it is bent twice—once when it enters the prism and again when it leaves. Your eye-brain system tries to follow this light back to its origin in order to locate the target, but it doesn’t have the ability to recognize that the light was bent. It follows the light back along a straight line defined by the ray of light that enters your eye, and so the target appears to be somewhere on this line. At first, your throws probably miss the target by a lot. Your brain, however, soon adapts to the distortion produced by the goggles, and your visual and motor systems make adjustments. You begin to aim farther to the side and get closer to hitting the target. When you remove the goggles, your brain remembers the prism distortion, and it functions as if the goggles were still in place. It may take a few trials for your brain to “unlearn” the adjustments it made and return to normal. Your experience with the goggles shows that your brain and and its different systems are dynamic: They continually respond and adapt to your experiences, whether or not you’re thinking about them. You forced your eyes and brain to adapt when you put on the goggles. But your brain is challenged on a daily basis to relearn skills and change the way it processes information—all it takes is driving someone else’s car, taking a new route to the grocery store, or putting your toothbrush in a new location. If we did not have the ability to adapt to changes in the world (or to changes in our perception of the world), life would be much harder. How Fast Do People Adapt? Try collecting quantitative data from different people using the prism goggles to find the range of learning and unlearning times. Can you think of experiments that would help you to figure out whether your sensory systems, your motor systems, or both, adapt to the goggles? Try switching your throwing hand after taking the goggles off, throw overhand rather than underhand, or cover one eye during adaptation, then switch eyes after removing the goggles. What would the results of these experiments tell you? Experiment with your goggles. Try different orientations of the prisms, or use different prisms. Is there something in your house that you use a lot and that has been in the same location for a long time? Change its location and notice how long you reflexively keep trying the old location first. How long does it take for you to completely change? We know where our bodies are even with our eyes closed. Your brain adapts quickly to a warped view of the world, turning baskets into air balls.